In the year 2041, the international agreement to keep Antarctica, the Earth’s last pristine continent, free of exploitation will expire. 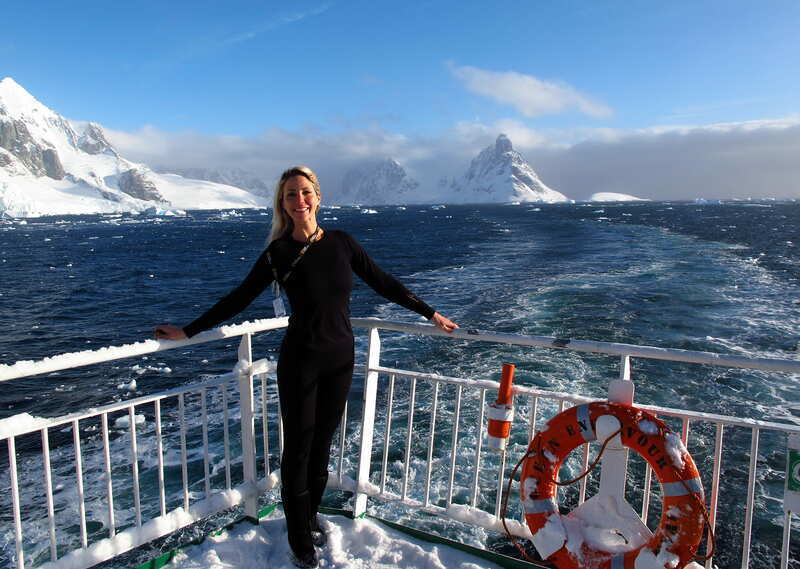 A lucky few get to experience Antarctica’s magnificence first-hand and as a result become champions in protecting it. What’s it like to go for a swim in the Antarctic Ocean? The plunge into Antarctica’s frigid waters was the climax of a two-week expedition Zornitza took to the frozen continent in March. The expedition was led by Sir Robert Swan, the noted polar explorer and first person to walk both the North and South Poles. Swan’s 2041 Foundation (2041.com) is named for the year when the 50-year agreement to keep Antarctica free of human exploitation will expire. Over the last 11 years, he has led more than 1,000 people to the southern continent. The latest expedition in March included NASA scientists, university professors, entrepreneurs, NGOs, management consultants, and three INSEAD alumni, including Zornitza, her husband Aaron Thompson MBA’13J and Amita Goyal MBA’13D. Antarctica is immense. Twice as big as Australia, it has 90 per cent of the world’s ice and 70 percent of its fresh water. But the Earth’s last pristine continent is under threat, as Zornitza and her group witnessed for themselves. The 2041 Foundation’s mission is to get people to experience Antarctica for themselves so they will become inspired to preserve it. During the March expedition participants attended workshops, seminars and lectures, all with an emphasis on environmental responsibility. And they also had a lot of fun. “We hiked up frozen volcanoes, crossed glacier crevasses, came within meters of feeding humpback whales, braved storms in Zodiacs to view icebergs, were chased by aggressive young fur seals, watched thundering ice shelves calving and were surrounded by penguins,” recounts Zornitza. For most people, the March expedition would have been a once-in-a-lifetime opportunity, but it was actually Zornitza’s second trip to Antarctica. During P1 and P2, her favorite classes were Uncertainty, Data, and Judgement and Strategy. Afterwards she enjoyed Industry and Competitive Analysis, Competitive Supply Chains and Management of Services. Zornitza also names professors Melissa Schilling, Neil Bearden, Enver Yücesan and Stephen Chick as among those who inspired her. INSEAD helped expand her environmental expertise. Involved in environmental conservation projects for as long she can remember, Zornitza has set up recycling days, written to governments about the slaughter of seals, stopped eating red meat and volunteered with the World Wildlife Fund and the International Fund for Animal Welfare. She has also created and maintains an informative and entertaining website called Our Breathing Planet (www.ourbreathingplanet.com), which presents the unique creatures and places of our planet. Now she is bringing her message of sustainability back to INSEAD. Alumni working in energy, for example, can promote renewable energy solutions. Those working in consulting can weave the message of sustainability into their projects within traditional industries. “The positive impact of alumni on sustainability can be absolutely massive,” she declares. Ultimately, it all comes back to Antarctica. “The preservation of Antarctica and our survival on Earth are linked,” Zornitza says. Simple steps such as eating less meat (animal agriculture emits more emissions than the entire transportation sector) and using more renewable energy would eliminate the need to exploit Antarctica and would slow down the ice melt. Clan you please put me in contact with zornitza Hadjitodorova, I was sailing in Antarctica in 2014, the experience can be summarized as being on another planet. Happy to connect you to Zornitza, please expect an email soon. This is awesome! Thanks for inspiring us with such a story. How can people apply to go? Please check http://2041.com/ for information on how to apply.